Hull Smoker BBQ Catering is the perfect way to cook the most amazingly tender and delicious BBQ food possible for the guests at your event. Hire our American-built authentic BBQ Smoker machine and we’ll also provide fully trained professional Pitmasters, experts at cooking in the BBQ Smoke Pit! Our caterers take extra time (over 15 hours before your event) to prepare our own home-made sauces, rubs and marinades which all use fresh ingredients, spices and herbs – we then soak and dip our meats overnight before cooking to deliver massive punchy flavours for your BBQ catering dishes. We serve Smoke Pit BBQ catering food at Weddings (amazing Hull Wedding Catering menus are available to make your event even more memorable!) as well as Birthdays, family gatherings, street parties and business events. Both indoor and outdoor caterers can be booked and we can cook the food out of the way or right in front of your guests to create a crowd of hungry spectators and some real wow-factor! Hull Smoker BBQ Catering meats include the very best locally reared free range and organic succulent Brisket, Pork Shoulders or tender Baby-back ribs to name a few. 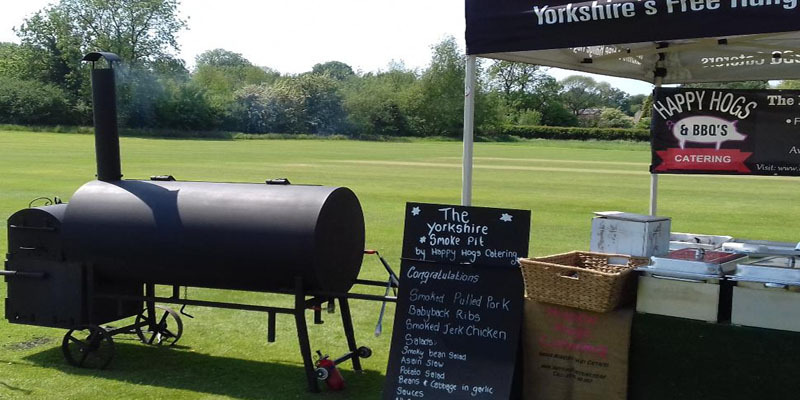 Our meat and BBQ food is award winning, we truly believe our Hull Caterers are the very best available and the great Smoke Pit tastes will keep your event guests always coming back for seconds!